The California Oak Mortality Task Force (COMTF) is a non-profit group working to manage Sudden Oak Death in California. COMTF was formed in August 2000 by merging the efforts of two separate state organizations: The California Forest Pest Council (CFPC) and the California Department of Forestry and Fire Protection (CDF). The resulting Task Force is a consensus-driven coalition of research/educational institutions, public agencies, non-profit organizations, and private interests. Its primary purpose is to coordinate research, management, monitoring, education, and public policy efforts addressing elevated levels of oak mortality in California resulting from Sudden Oak Death (SOD). 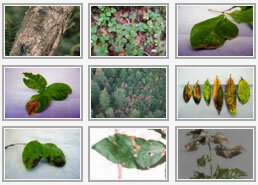 As we learn more about P. ramorum, our concern has broadened to include the other diseases it causes. Minimize the impact and spread of Phytophthora ramorum on natural, agricultural, and human communities. Coordinate an integrated response by all interested parties to address Phytophthora ramorum. Serve as liaison to local, state, national, and international groups.